It almost came as a surprise to be writing this book, as the …of Mars books were, yes, originally devised as a trilogy, but then became a duology. Before, once again, becoming a trilogy. That can partly be ascribed to schedules changing, me coming up with more ideas in the writing than I’d expected and a story that (surprise, surprise) grew in the telling. So, finally, the Kotov Expedition finally meets Archmagos Telok, achieves all they set out to do. All is tea and cakes, right? Not so much, as this is 40k after all. They say you should never meet your heroes, right, as they’ll never match up to your expectations. Another thing they say is be careful what you wish for. 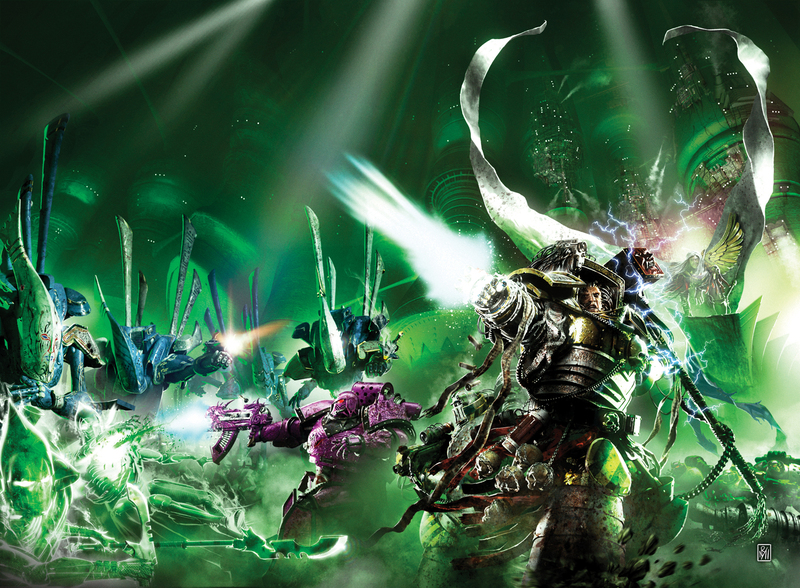 Both of these are fully borne out in the course of this book, as Archmagos Kotov finds that his long-lost hero is both more and less than he hoped. With Gods of Mars, I had quite a lot of story threads to tie up (though, deliberately, not all of them would be…) since the idea of the novel as having a central character we followed through the book – originally intended to be Abrehem – kind of fell by the wayside by the end of Priests of Mars when it became clear the book had kind of turned into an ensemble piece. The books were a slice through the Explorators, with no one character taking the centre stage for too long. After Linya’s shocking ending in Lords of Mars, I knew where her story was going to go and how it would play out (in the broadest sense – it changed along the way), as I did Bielanna’s, Tanna’s and Kotov’s. What I didn’t know going into this book was how Abrehem’s was going to play out. And that one turned out to be the one that surprised me the most. I’d originally thought that he’d simply become apprenticed to Chiron Manubia, and end the book going back to Mars as a newly-inducted Priest of Mars, but that seemed a little too pat, especially given the talents he’d developed over the course of the books, and his eventual fate was one I didnt’ see coming almost until it played out. I wanted a different feel for each book, and the third book was no exception. Where the first two hadn’t had a great deal of battles in them – they’re not about organisations intended for war – the third one was the culmination of a bunch of storylines that needed that cathartic release of violence. The titans, Templars and Guard had to get their moment in the sun to show what they could do, as did Magos Dahan (Matleo! Mataleo!) and his skitarii. And being this far outside the normal run of things was a great excuse to utilise enemies and technology we’d not seen before. So we have opponents for our heroes in the form of the monstrous Tindalosi, an obvious nod towards the mythos creatures of Frank Belknap Long, and an enemy worthy of being fought by the Space Marines. Likewise the crystaliths, who more than give the Black Templars a run for their money at the end. And their ending was one of the things I had planned from the very beginning of the trilogy. I just hadn’t planned on it being so emotional to write, with the characters who remained so perfect for the passing of the Black Sword it was like I’d actually preplanned which of them would get to that moment. Which I had, sort of. And their fear that they would never be remembered, that their legacy would die with them…a fear unrealised, as Yael would return to the Eternal Crusader with tales of their heroics (though he might leave out the part where they fought and died to defend a bunch of eldar…). This series of books was an utter joy to write. Possibly because it dealt with the Adeptus Mechanicus, who I’ve always had a soft spot for, but mostly because it was something utterly unlike anything I’d tried before. It was a novel of exploration, not of war, of discovery, not stagnation. Things we don’t normally get to write about in 40k. And, as I’ve always been told, never be too tidy in wrapping up all your endings. Leave things untold, unsaid or unresolved along the way. Not so much as to leave the reader unsatisfied, you can’t do that or the book will be put down with a vague sense of something not being right. The story needs a conclusion, but not all of the characters need so neat a bow tied in their endings. I can see more stories of Hawke and his new eyes. Will they do for him what they did for Abrehem? Roboute Surcouf and his crew…they’re heading back to Ultramar, so what further adventures might they get caught up in, as I don’t see a quiet retirement on the cards for any of them? What will become of Vodanus if he gets back to Mars? And Tarkis Blaylock, what of him? Is he even Tarkis Blaylock any more? You know what, I reckon there’s easily another novel on this. And if there’s enough interest from the readers and editors, maybe I’ll write one set during a struggle to become the Master of Mars… Now what could I call that book…?